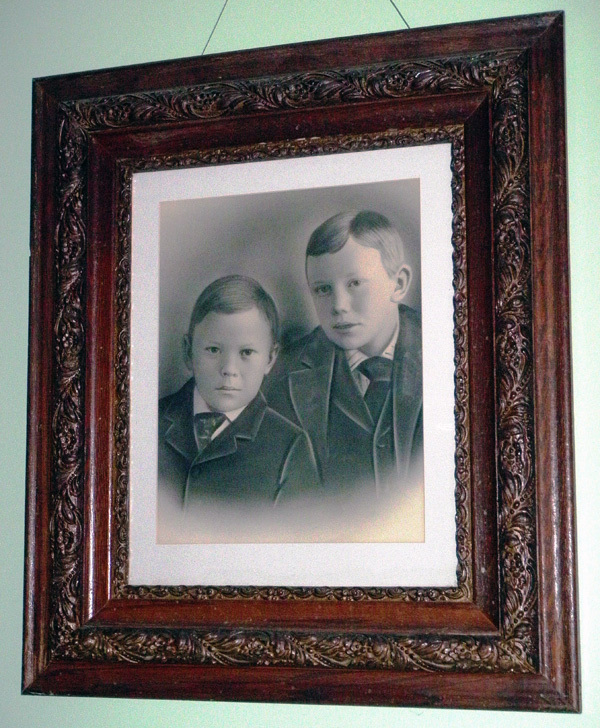 At first this artifact appears to be a charcoal drawing of John William Walter and his younger brother Stanley. In fact, it is an enlarged photograph that has been painted with charcoal. Full-sized portraits such as this one were especially popular in the late 1800s in Canada, so it is not surprising that we might find one belonging to Walter family. The work of overpainting photographs was usually done behind the scenes in the photographic studio, and often by women. Some overpainted photographs featured embellishments, such as gold flecks to highlight a piece of jewellery. Others hid their photographic core so well that they were easily mistaken for paintings. Perhaps what is most interesting about this photograph is the fact that the techniques we find in digital photography, such as retouching and airbrushing are not new concepts after all.